The sights and sounds of wartime Britain are being celebrated at the Midland’s historical attraction with forties glamour heading to the Black Country. 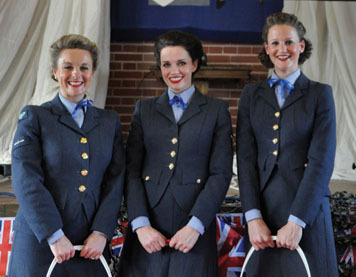 Visitors can expect a nostalgic journey back to the sweet sounds of WW2 with wartime melodies taking centre stage. The 1940s weekend welcomes visitors to relive the era of wartime Britain as the squaddies, G.I.s and Land Girls, Canaries and a cavalcade of military vehicles patrol the streets. The wonderfully witty Dodging The Doodlebugs Variety Show will be paying homage to the stars of the 1940s whilst unique 1940s films will be played out to audiences in the Limelight Cinema. Vocalist Laura Bill will shake up the summer season with an evening of sizzling forties songs and ‘Make Do and Mend, Home Front Kitchen and Beauty Tips’ for the ladies are just some of the entertaining topics on the menu. If fashion is more your indulgence don’t miss the display of vintage wedding dresses showcased in the chapel, or maybe a gander around the memorabilia market will ignite your 1940s flame. This entry was posted in Festivals, Music, Performance, Wolverhampton and tagged Black country, Black Country Living Museum, Fabulous Forties, Vintage, Vintage events. Bookmark the permalink.